How many of you bought tickets for the Powerball over these past weeks? How many dreamed how winning $1.5 billion would change your life in the most beautiful way? (Actually, like the couple in Tennessee that won, you would take home $157 million after taxes.) Would that seem like a dream come true? Is this what many of us dream about – quick riches? Is that why we buy lottery tickets or go to the casino? Well, here is one of the great LIES of our age. The devil, the father of lies, fools many people, including many followers of Jesus Christ, with this lie. We dream a fool’s dream of winning the lottery, hitting it big in the casino, getting rich quick, and thinking that money and wealth will make our life great. Let me say very clearly – according to Holy Scripture and our Orthodox Christian Faith this is a lie! As a Christian, life shouldn’t be about getting rich and finding happiness through money! In fact, quick riches or even gradual wealth will spiritually destroy most people. This is why Jesus said that it is harder for a camel to go through the eye of a needle than a rich person to enter into the kingdom of heaven. One of the great deceptions of this world is understanding life only limited to the here and now, to this material world. We forget that our eternal God created us to live eternally with Him. “My followers are not of the world.” This prayer highlights that Jesus prayed for his disciples to not become too attached to things of the world. He prayed as well that his followers would not be taken out of this world despite all the challenges, struggles, dangers and evil they would face. Remember, during the first century, the early Christians faced many seemingly insurmountable obstacles – a Roman Empire that despised them, a Jewish community which rejected them, slander, danger, persecution and martyrdom that awaited them. Interestingly enough, though, Christ did not pray for his followers to be taken out of any difficult situation, nor did he pray for them to become successful and wealthy and comfortable. Instead, our Lord prayed that his followers would be filled with God’s might to do His will in this world, and to be protected from whatever temptation came in their midst. Jesus also reminded his disciples of something else - to keep an eternal perspective in the world. Just as He Himself wasn’t of this world, Christ’s followers should never identify too closely with worldly and material goals and passions. Our true home and citizenship is not simply here and now on earth, but here and now as well as for all eternity. We all are simply sojourners passing through this brief life here and now. During our earthly sojourn, we may be rejected and never feel too much at home, because this actually isn’t our permanent home! We were created for eternity, and our eternal citizenship is in the kingdom of heaven. Keep your eye on eternity, in heaven, and you will experience the kingdom of God here and now. Keep your eyes focused on earth and the temporal world, and you will gain neither earth nor heaven. Jesus supported this idea by telling his followers, “If you love the world, you do not belong to me.” Don’t become too attached to the things of the world. Everything is temporary. Today and tomorrow we celebrate two of the greatest saints who represented this attitude of “being in the world, but not of the world.” St Anthony the Great is considered the father of monasticism. When he was a young man, he heard the words in Church, “If you would be perfect, go sell what you possess and give it to the poor, and you will have treasure in heaven; and come, follow me.” (Mt 19:21) Hearing these words, he immediately sold all he had, and fled into the desert to seek constant communion with God. For the next 85 years, he wrestled with the devil and demons, and strove for perfection with God. His life inspired a great movement of people to “flee the world” in order to seek out God in the desert. This is why he’s called the father of monasticism. He wanted to become perfect, as our Father in heaven is perfect, and felt the way to do this was by fleeing the vanity of the world, and focus on unceasing prayer to God. 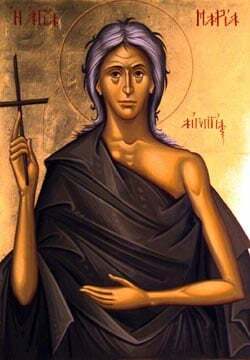 St. Athanasios the Great’s writing on The Life of St. Anthony exposed much of the Christian world to this new form of Christianity – this intense monastic struggle to deny the world and yet, to discover the greatest riches of the world, the pearl of great price in Jesus Christ. Yet St Athanasios himself became another an incredible example of being in the world but not of the world. In fact, there is a phrase “Athanasios against the world” precisely because he willingly stood up against much of the world, including much of the Christian world, when they had fallen into erroneous beliefs about Jesus Christ. It didn’t matter to him that all the world went in one direction, he would keep the course in the only true direction which led to union with God. St Athanasios suffered for his stance – being expelled from Alexandria several times, including being exiled for more than 20 years from his Episcopal throne. Yet he never compromised the faith or water downed the truth. This is the faith of our forbearers, and this is the extreme faith we are called to imitate! Both St. Anthony and St. Athanasios were charismatic figures who did not give into the lies of this life. They understood the temporal nature of life and thus willingly sacrificed worldly pleasures to seek out the eternal joys of the kingdom of God. They lived in the world, but were not of the world! May we each see through the glitzy lies of the world – the billion dollar powerball dreams, or any other such foolishness, and may we remember to seek first the kingdom of God all his righteousness, and all other things will be given to us.